Below is a comprehensive list of hotels in Port Gaverne. Use the sort links to refine your search or to find featured accommodation in Port Gaverne. Many of our hotels in Port Gaverne feature no booking fees and best price guarantee when booked through the Pictures of England website. To list your hotel in Port Gaverne, click here. Cornishman Cottage is a holiday home with a garden, set in Port Isaac in the Cornwall Region. The property boasts views of the garden and is 27 km fro.. Apartment 4 The Halcyon is a holiday home is located in Port Isaac and is 27 km from Newquay. The property is 10 km from Padstow and free private park.. Apartment 2 The Halcyon is a holiday home situated in Port Isaac in the Cornwall Region and is 27 km from Newquay. The property is 10 km from Padstow .. Apartment 5 The Penthouse is a holiday home with a balcony, located in Port Isaac. It provides free private parking. The kitchen features a dishwashe.. Apartment 1 The Halcyon is a holiday home is situated in Port Isaac and is 27 km from Newquay. The unit is 10 km from Padstow. A dishwasher, an oven .. Apartment 3 The Halcyon offers accommodation in Port Isaac, 27 km from Newquay and 10 km from Padstow. The unit is 48 km from Tavistock. The unit is ..
Suncroft is a holiday home set in Port Isaac, 27 km from Newquay. You can fire up the barbecue for a tasty meal and enjoy the garden in fair weather. ..
Little Beside is a holiday home situated in Port Isaac in the Cornwall Region and is 27 km from Newquay. The unit is 10 km from Padstow. Free WiFi is .. Located in Port Isaac in the Cornwall Region, this holiday home is 27 km from Newquay. The unit is 10 km from Padstow. Free WiFi is provided throughou.. Featuring a barbecue, Sea Spray is a holiday home located in Port Isaac. The property is 27 km from Newquay and free private parking is featured. The..
Sea Thrift is a holiday home situated in Port Isaac and featuring a garden with a barbecue. The unit is 27 km from Newquay. There is a dining area an.. Located in Port Isaac in the Cornwall Region, this holiday home is 27 km from Newquay. The unit is 10 km from Padstow. 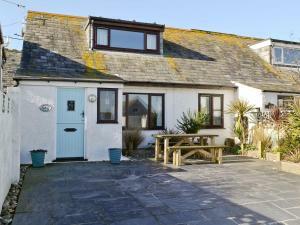 An oven, a toaster and a refri..
Dolphin Cottage is a holiday home situated in Port Isaac, 27 km from Newquay. The unit is 10 km from Padstow. An oven and a toaster can be found in t..
Saundry's Barn is set in Port Isaac, 27 km from Newquay. Every room is fitted with a TV. All rooms are fitted with a private bathroom. Padstow is 10..
Carlenice is a holiday home set in Port Isaac in the Cornwall Region and is 27 km from Newquay. The property boasts views of the city and is 10 km fro.. The Lookout is a holiday home set in Port Isaac, 28 km from Newquay. The property is 11 km from Padstow and boasts views of the garden. Free WiFi is f..
Set in Port Isaac in the Cornwall Region, this holiday home is 28 km from Newquay. The unit is 11 km from Padstow. Free private parking is available o.. Located 27 km from Newquay, Hillside offers pet-friendly accommodation in Port Isaac. The unit is 10 km from Padstow. Free WiFi is provided throughout..
Mainbrace is a holiday home located in Port Isaac in the Cornwall Region and is 27 km from Newquay. The unit is 10 km from Padstow. Free WiFi is provi..
Polgarth is a holiday home set in Port Isaac in the Cornwall Region and is 27 km from Newquay. The property is 10 km from Padstow and free private par..